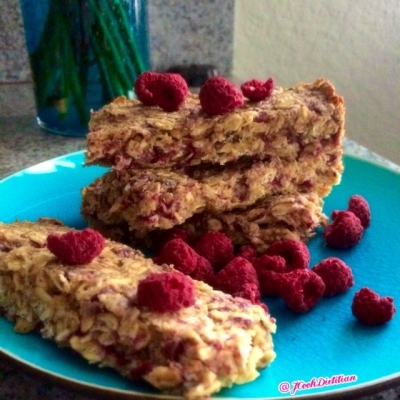 Clean, gluten free homemade protein bars made with coconut and raspberry! 1 cup gluten free oats, 1/2 cup light coconut milk, 1/4 cup almond butter, 1/4 cup agave nectar, 1 scoop vanilla protein powder, 1/2 cup shredded unsweetened coconut, 1 cup freeze dried raspberries chopped. To prepare first mix coconut milk, almond butter and agave nectar until smooth. Add the dry ingredients and lastly fold in dried raspberries. Bake at 350 degrees for 12 minutes.